Welcome to my blog! I'm so glad you're here, and that we can share our One little word-journeys with each other. New years resolutions is nothing for me, it´s too much "made up" and it feels like a pressure and something I have to live up to, rather than a helpful tool. But this year I really wolud like to get my acts together as I'm about to leave the SAHM-phase of my life and find a new direction. So I need- a helpful tool. 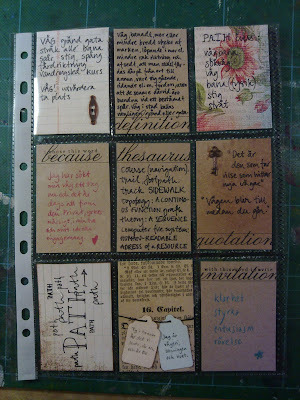 I stumbled upon a class and a concept, at my trusted scrapbook class site Big Picture Classes. This was Ali Edwards idea of choosing a word as a kind of headline for a whole year, and use it to explore life and your own beeing. This was what I needed! When I read about the class I started to think about which word I could choose. I thought it wouldn't be any use of signing up for the class if I didn't have a word to start with. But the word popped up almost immediately: I want to know my PATH. I'm looking for my own path through life. The word that found me is in English. I'm not! But i decided to stick to the English word and to use the translations to Swedish too. I like to see the differences between the words and to use them to further explore my word and it's meanings. Some things are lost in translation, but some are gained! The Swedish word for PATH is STIG which means more like foot-path or trail, a much smaller track than I would like to see before me through life, haha, but still quite an intriguing thought to ponder. Another swedish word that I could use is VÄG, but that is a very "broad" word that can mean anything from lane to street- or the road itself. Now I have lived with this word for a month, and so far it has ment that I have reduced my involvement in my church, I have taken a one day class in writing (which is what I really want to do) and I have taken up reading the Bible again after several years (!). The last one is the hardest actually, it's hard to commit to doing something every day, and it's also the most surprising to me. I'm curious to see where it will lead me. On which path? The translations of the cards from top left: synonyms to the word VÄG (way), old encyclopedia definition of VÄG, translations of PATH to swedish, reasons why I choose this word, synonyms to PATH, two quotes: "those who get lost find new paths", "the way become (?) as you walk", the word PATH, two scriptures: act 17:28 and john 14:6, my invitation to clarity, strength, enthusiasm and movement. And today it's time for the second assignment from the class! I can't wait! The next blog in our blog hop is Debras beautiful place, please go and visit her too! It all starts at Margies place. I love the idea of looking at your word in different languages. so cool! What a beautiful word to have chosen. May you enjoy what your word has to offer you this year! Wonderful word and the picture of the forest path is beautiful. So lovely. I like the examination of the language difference and the photo is perfect. Best wishes to you on your path wherever it may lead. How lovely. It's nice to be able to share your word in another language. Gives it more depth and scope. I love how you explained your choice of word and that you can look at it in 2 languages. Good luck with your OLW journey this year. I've never commented in Swedish before! lol I love your word, and especially that you're using both languages. Your photo of the road is beautiful! See you around the classroom! Thank you for sharing your word and story. Finding one's path is a goal for all of us at some time in our life. Thank you also for doing this blogpost in English! I love your layout and classy embellishments! I hope your path this year is smooth and leads you where you want and need to be! I love the photo of the path. So beautiful. Good Luck to you on your journey. I often feel I need to find my path. It can be such a slow journey - for me anyway. Your post is very inspiring! Thanks for joining the blog hop! Wow! I am so intrigued by the fact that the english word chose you as apposed to the word in your native tongue. your pages are just beautiful. Nice word... I really love it! love your word and that you have it in 2 languages...so so powerful!!!! I hope you will find your path this year. Good luck! I love your photograph - just perfect for your word. What a great word! I love the photo. I look forward to reading more on your journey. I love the description of how you explored your word in Swedish and English and the art journaling approach of your cards.